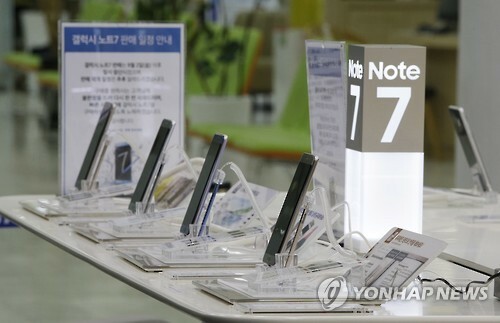 WASHINGTON, Sept. 15 (Yonhap) — The U.S. consumer protection agency on Thursday announced an official recall of the Samsung Galaxy Note 7 smartphones due to a battery problem. “Samsung has received 92 reports of the batteries overheating in the U.S., including 26 reports of burns and 55 reports of property damage, including fires in cars and a garage,” the U.S. Consumer Product Safety Commission said. “Consumers should immediately stop using and power down the recalled Galaxy Note 7 devices purchased before September 15,” the agency said, advising consumers can receive a new Galaxy Note 7 with a different battery free of charge, a refund or a new replacement device. Subject to the recall are about 1 million smartphones, it said. Earlier this month, Samsung announced a global recall of the Note 7 smartphones as some of their batteries caught fire while being charged. Samsung also decided to replace all Note 7 smartphones sold to customers with new ones.